Dream pillows aren't just for kids! 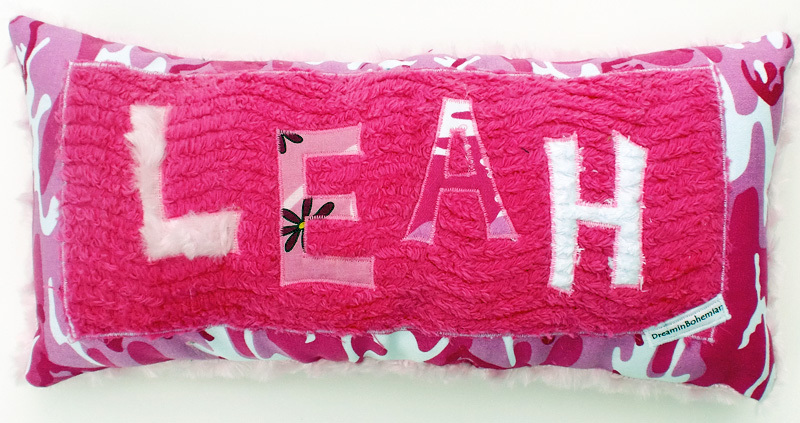 I can create a one of a kind name pillow for your home or cottage or little cabin in the woods. I will work with you on fabric selection and any sort of theme you have going on in your home. I love coming up with new designs, call me for a custom today! 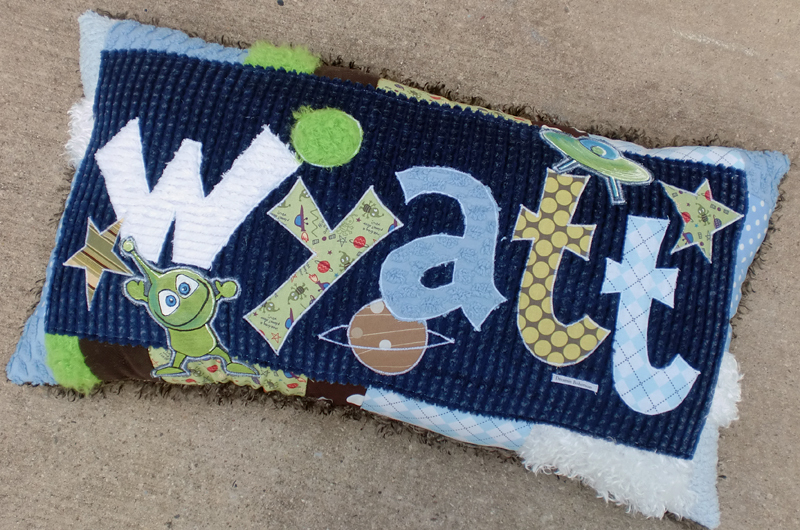 #p1012 Custom Name PILLOW "Alien Space"
Adorable and fun all in one. These "Dream" pillows make awesome gifts!! They are my hottest seller here locally. Made with an array of all kinds of fabrics. Chenille, cottons, flannels, silky fleece, vintage fabrics and hot of the press designer quilt fabrics. This design is called the "Outer Space" pillow you can have any name you would like. 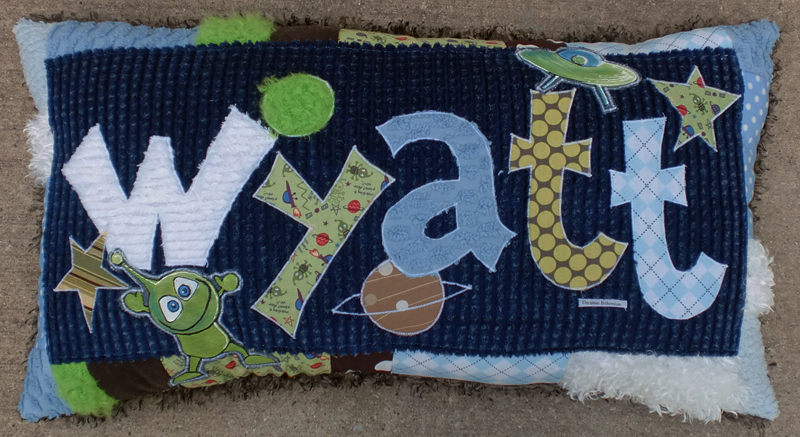 But if you order the "Outer Space" pillow you will get the the different shades of greens, blues and a little khaki tan, perfect for a little boys room. Backed with a chocolate brown silky fleece. Fabrics can vary, but will be as close as possible to the ones used in the sample. The sizes of the pillows vary according to the name chosen to be appliqued. They generally stand 10-12" tall and are anywhere from 20-40 inches long. If you need a specific size please add that to your custom requests. Please note the base price of 65.50 is for up to 4 letters. After that add 8.25 each additional letter. 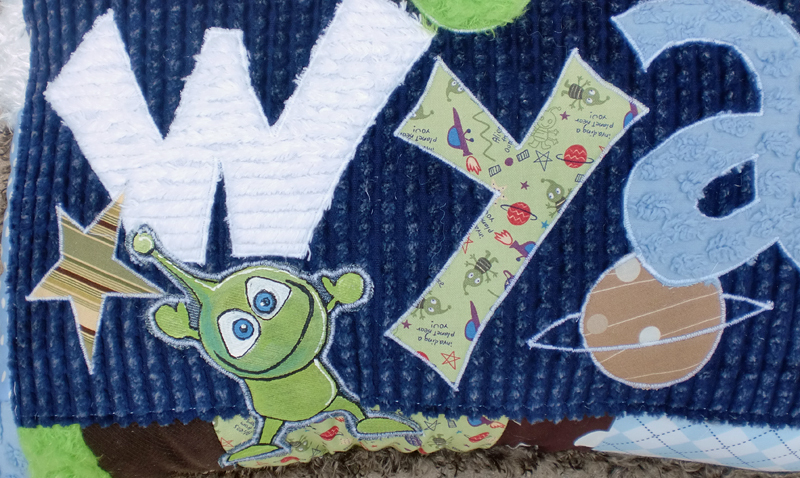 This pillow has hand painted appliques in it as well, a sweet and goofy alien and his space ship. 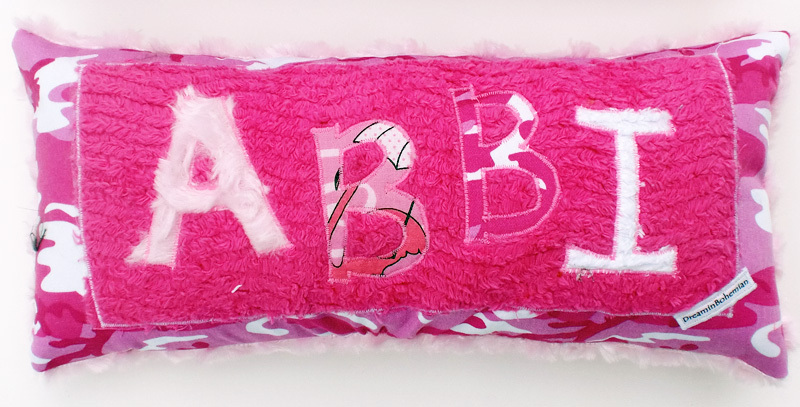 #p1021 Custom Name PILLOW "Bailey"
Gorgeous and fun all in one. These "Dream" pillows make awesome gifts!! They are my hottest seller here locally. Made with an array of all kinds of fabrics. Chenille, cottons, flannels, silky fleece, vintage fabrics and hot of the press designer quilt fabrics. This design is called the "Bailey" you can have any name you would like. But if you order the "Bailey" you will get the the different shades of pink and a little bit of lime green. Backed with a hot pink silky fleece. Fabrics can vary, but will be as close as possible to the ones used in the sample. Please note the base price of 49.50 is for up to 4 letters. After that add 8.25 each additional letter. 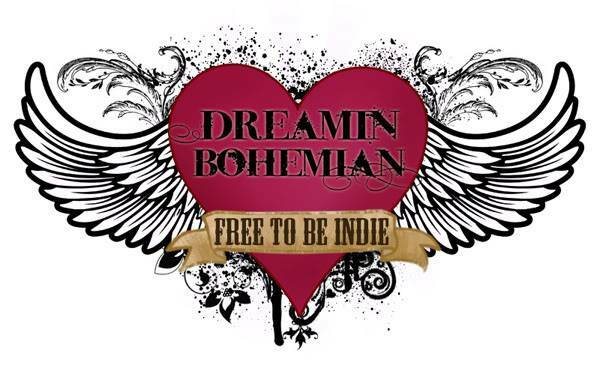 You can also get an added appliqued emblem like a crown as pictured or peace sign. Just click the option for what you would like when ordering. #p1020 Custom Name PILLOW "Charlie"
Vintage Looking chenilles, corduroys and fun flannel plaids make up the Charlie pillow. 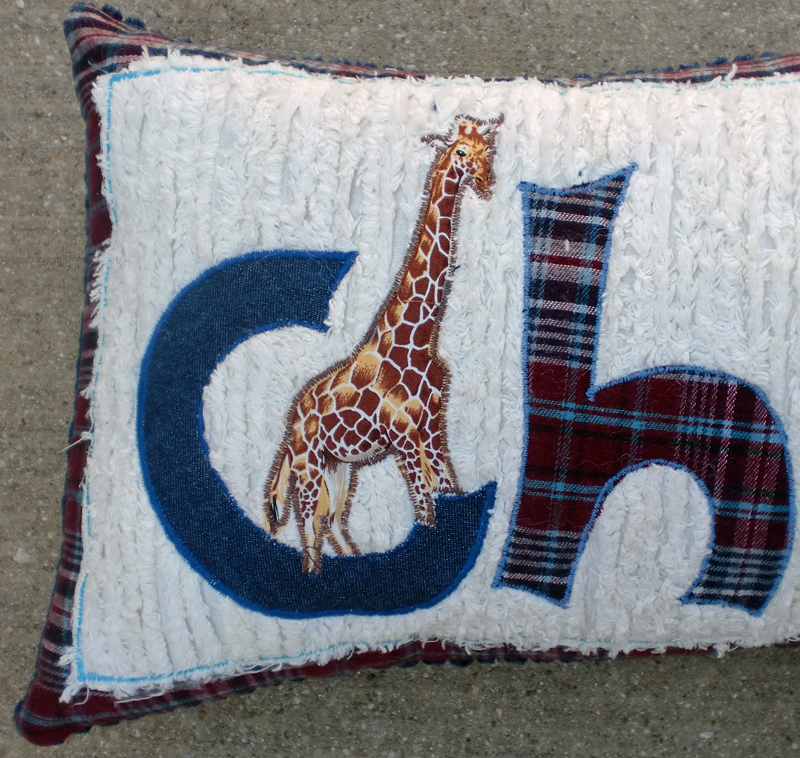 I love the way this one turned out, and Charlie loves giraffes, which is why he gets one appliqued right on the pillow along with his name. Custom made pillows for boys, girls, or even your own cottage decor. Lovely! This style starts at 39.00 for the first 4 letters and an additional 6.00 a letter after 4 letters. 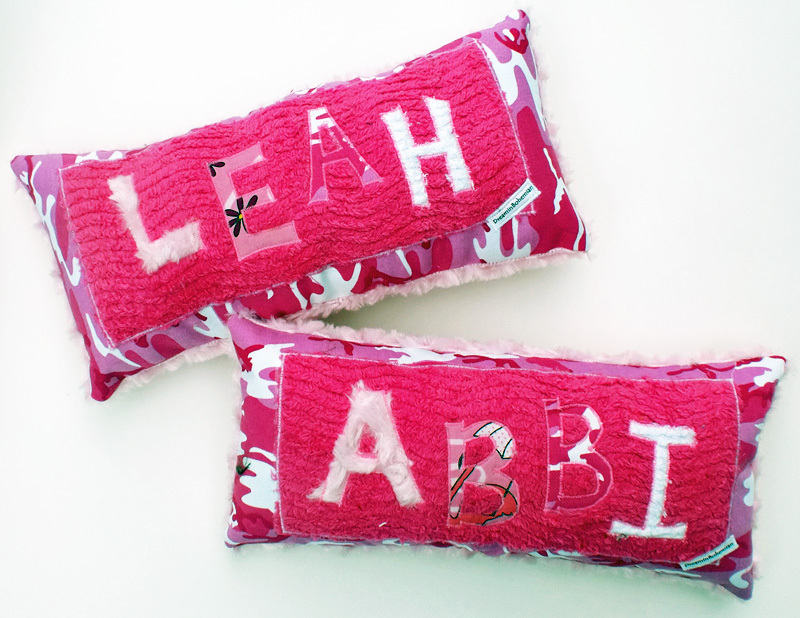 #p1018 Custom Name PILLOW "Petite"
This particular design was for someone who wanted two in all pinks. You can get yours in the colors of your choice, however the samples I have are in pink! 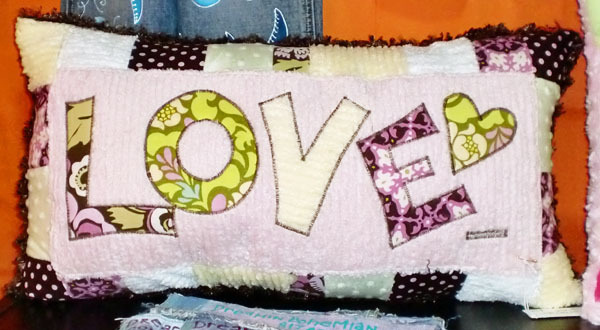 This pillow is backed with a plush rosebud fleece--super soft! These start at 36.00 for 4 letters and 3.00 a letter after the first four letters. 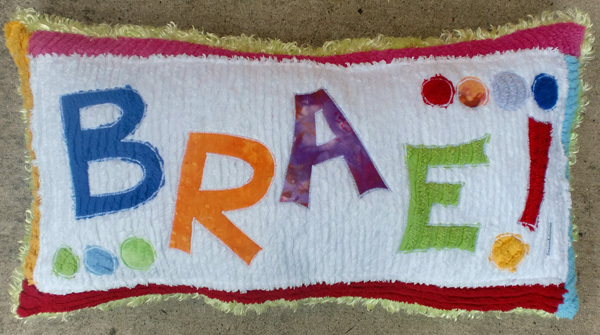 #p1019 Custom Name PILLOW "Snooze"
I used chenilles, batiks, fleeces, applique, and well, lots more! These Snooze pillows are 72.00 for complete customization of what YOU dream about while snoozing on the couch. You will get 7 "Z"s and a couple other appliques if you wish, of your choice.